Later this week I’ll be turning the grand old age of 33. (That’s okay – that’s still early 30s right?!!) But thats not the only birthday celebration happening in our house this week. It’s also my Blog Birthday. This weekend one year ago, my domain registration came through, and I started setting up Mama.ie. Then on November 2nd, I published my very first blog post. And since then I’ve posted something almost every day – whether it has been a rant lamenting a broken night of sleep, or a therapeutic post recounting the trauma of being locked in the kitchen by my then 15 month old, or a review of the latest app that’s holding our attention, or a product that we simply can’t do without – and before I knew it, what started out as a little outlet for my inner baby bore, has turned into a full-on blogging addiction! I never expected to enjoy it this much. And along the way, more and more people have started reading my blog, and commenting, giving me feedback and encouraging me. 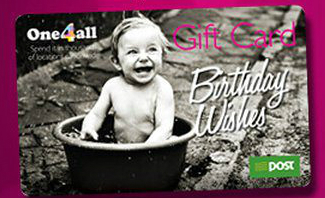 So as a thank you to all of you who read this blog and who have given me so much support and encouragement during the year, I’m providing a €50 One4All gift card as a prize in my special Birthday giveaway. The competition runs from Sunday October 30, 2011 until 6pm GMT on Sunday November 6, 2011. You must leave a separate comment below for each entry that you make to be entered. A winner will be chosen on Sunday November 6, 2011 using Random.org, and will be announced here on Mama.ie. 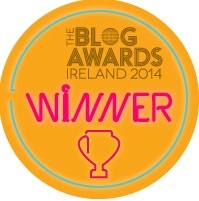 The winner has two weeks to contact me at Lisa[at]mama.ie to claim their prize. If a prize is unclaimed after two weeks, a new winner will be drawn. The winner’s contact details will be used to arrange prize selection and delivery. Competition is open to Republic of Ireland residents only. I really enjoy your blog- it gives me so many ideas for when I become a mama in February! Keep up the good work! Congratulations on 1 year of blogging and happy birthday!! Happy birthday! wish I was yur age!!!! Sorry we wont see you for your birthday. Let me know what evening suits you to skype. Happy birthday – i’m finding my 30’s the best years i’ve had so far (well ones that i can remember) so enjoy and keep up the excellent work with your blog! Just recently discovered your blog and Im really enjpying it! Read your section on baking. I totally agree that this is an excellent form of kiddie entertainment…i still remember how I loved making rice krispie buns with my mam many moons ago! Anyway best of luck with the blog! Happy birthday on both counts! Wishing you and your blog a very happy birthday! Hope you keep going from strength to strength. Happy Birthday to you and your blog… very enjoyable reading! Congratulations. Glad its going so well for you. Really enjoyed the blog. great work, keep it up!!!! Happy Birthday Lisa and congratulations on reaching a year! Happy 1st Birthday, and love the blog. Wishing you a happy birthday, would love a voucher. Another wonderful giveaway! Ive recommended your blog to pals. Very enjoyable. Excellent is the word thats suits you. Happy birthday. 30 s are great. Great to read your blog! Happy birthday to you Lisa and mama.ie!! happy birthday and congratulations on running a fabulous blog! Just new to the Blog, but great competition. Fingers crossed!! Great Blog – happy birthday and may you have many more! Happy Birthday and congratulations on your sucess so far! For once a useful blog. Thanks Mama. Goo Ga Ga Ga!!! Never followed a blog before. Might start – looks interesting. Of 8!!! Wow! Well done you! One is hard work sometimes – I can’t imagine 8! Happy bday ! Really excellent writing here ! Happy birthday 🙂 Keep it up! hav a very happy birthday wud lov de prise so i cud send ye a nice card!! Happy birthday on bount counts and congratulations on your blog!! Happy Birthday, sure life is in full swing for you!! Oooh! Christmas shopping helper please, thank you! Happy birthday! Oh I don’t think it has been Marguerite. I think it was a few months before I told anyone what i was up to!! Oh.. all the 3s.. My life began at 33 with the birth of my little lad.. little did I know that 33 would be such a fine year! I wish you as many new discoveriesand many many moments of joy and sheer happiness during your 33rd year as I had..
Congratulations on 1 year of blogging and keep the ranting and raving going, we all do it. Thanks for all the enjoyable and inspiring posts – I love catching up! I really enjoy the blog, great competition, keep up the good work.